The ‘rediscovery of public health’? 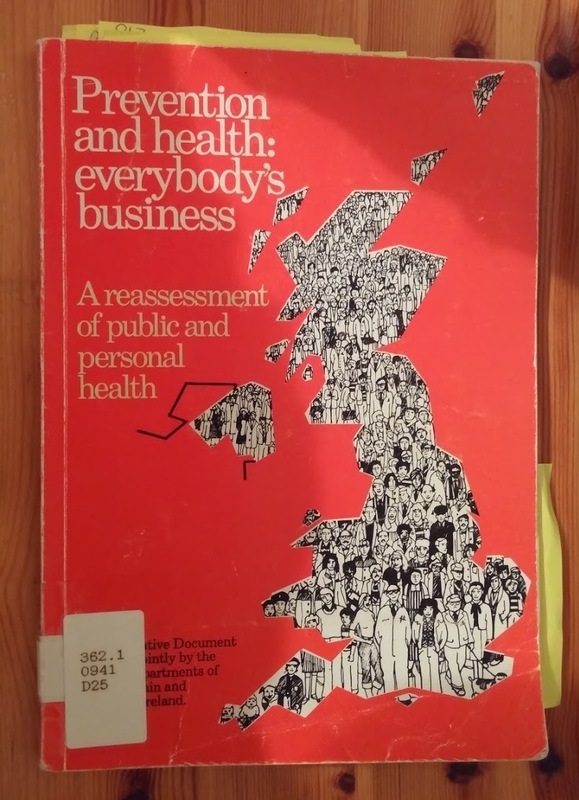 Studying the history of public health in Scotland and the UK since the 1970s I’ve been struck by periodic references to the ‘rediscovery of public health’. The 1976 report Prevention and Health: Everybody’s Business was hailed as one such rediscovery. However, the rediscovery was perhaps related to the idea that investing in public health was a cost effective means of public service delivery -a theme present in discussions of funding for public health since the allocation of Poor Law relief in the 19th Century, but also very familiar to us today. While the report did acknowledge the importance of structural factors in health inequalities, it also introduced a trend of highlighting a set of individualised ‘risk factors’ in understanding the health of the population and the promotion of ‘healthy lifestyles’ as a way of improving public health; suggesting that individuals should take more responsibility for their own health –sound familiar? This debate between the importance of addressing health inequalities and the material structures that they are based in: poor housing, low incomes, lack of access to education and community resources, versus the need to encourage individuals to take responsibility for their own health characterised the content of public health reports throughout the 1980s and 1990s. In 2004 the Choosing Health white paper dropped explicit reference to health inequalities in what Elizabeth Dowler has described as a retreat ‘back towards lifestyle and behaviourist approaches’. Again public health was hailed as cost effective, but no systematic approach was implemented, despite this recommendation in the earlier Wanless review. In Scotland, there have been signs of a different approach. Sir Harry Burns, appointed as chief medical officer, Scotland in 2005 has supported the role of asset-based approaches to public health. Asset-based approaches look at what existing resources people already have and seek to support them to sustain health and well-being rather than solely identifying good health as the absence of a list of ‘risk factors’. However research from the Scottish Public Health Observatory has warned that this approach could potentially widen health inequalities rather than reduce them. What has struck me is not just the repetitiveness of the discussion and comment on public health from the 1970s, but how much it fails to take into account what we know about how people make choices about their health. In 1990 anthropologist Mildred Blaxter published her research on Health and Lifestyles. She concluded that if people lived in good circumstances ‘healthy’ behaviour had a strong influence on health, but that if circumstances were bad, then adopting ‘healthy’ behaviours made little difference. Moreover, few people’s lifestyles were either totally healthy, or totally unhealthy; some people smoke, but takes lots of exercise, while others may not smoke, eat well, but not do exercise. Thus an approach to health promotion that simply advocates a list of health do’s and don’ts is limited in its effectiveness, because it doesn’t take into account the realities of people’s lives. -What kind of culture does our current system of care reflect? Posted on June 5, 2015 June 5, 2015 Author gillmurrayCategories UncategorizedTags assets-based approach, cost effective, history, public healthLeave a comment on The ‘rediscovery of public health’?